Google tested many interfaces for displaying related searches: at the bottom of the page, above the search results, in the left or right sidebar. A recent experiment adds some related searches to the toolbelt, the sidebar that includes many advanced options. Alistair Lattimore noticed that a search for [Circle on Cavill] returned a big list of refinements in the sidebar: restaurants, retail, apartments, for sale, map, parking, hotel, movies. 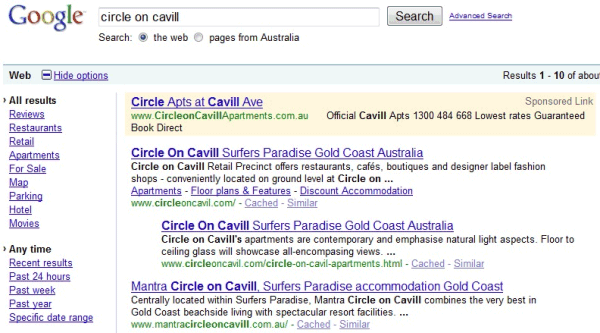 Selecting one of the suggestions changed the query to [Circle on Cavill restaurants] or [Circle on Cavill retail], even though the search box didn't change the query. Some would say that Google borrowed a Bing feature, even if Google tested it earlier or Hakia used it before Bing. What I find troubling is that Google combines site categorization filters like forums or reviews with search refinements. While it hadn't occurred to me until now, this sort of functionality is similar in nature to Google Squared. Google Squared was to extract facts about different categories of information. The contextual filtering provided within the search options could be considered columns within a square and the search results the facts. Unfortunately after testing that theory using Goolge Squared, I'm unable to return the same style of information but it's an interest concept I think. Yeah, google did search refinements way before bing. I use google just 8 years.In this time I see Google's artifical intelligence is very powerful, so Google did search refinements way before bing. I had always believed Google with accurate results and now with the navigational results they are now more ahead than Bing. Google's result display section is really having that capacity to show the interfaced results which really gets a better found for the end users and even its really better for the stronger part of it..